We, Evija and Inga, began our amazing journey in the summer of 2000. With just $100 bucks and our backpacks, we left behind our studies at the Latvian Academy of Sport Education, our families, our birthland, Latvia, and went in search of the American Dream. Call us crazy? You’d be right! With our $100 fortune, we landed on American soil for the first time—sunny Orlando, Florida. What was our first job? Housekeepers! We worked all day and pretty much through the night cleaning motels and hotels for very little money. Very little. Our living arrangements? An exchange student facility that was very far from our “swanky” jobs. We were in desperate need of transportation, so we invested in our first set of wheels—BICYCLES! The best, most affordable bikes we could find cost $50 bucks each, but they took us to one of those “magical moments” that changed the course of our destiny. We listened to his advice. We went back to our pathetic apartment, gathered our belongs and left without ever looking back. Uncle Bill helped us find better jobs at a dinner show and a nicer, affordable apartment. We began earning more money and purchased a modest car. Uncle Bill helped arrange for us to go to school to improve our English. He saw the “immigrant mentality” in us—the ambition, sense of adventure, fearlessness and desire to succeed. We fell in love with America. We became more and more integrated into this beautiful country and all it had to offer. And then, more angels? It was the summer of 2003. We were on another adventure in Florida when yes, we crossed paths with another angel—Pam! 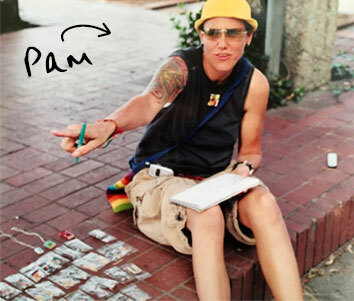 An amazing and intelligent person, a loyal friend, and a creative artist, Pam inspired us to love art. Art became our passion. But a career in art? Us? It seemed like a crazy idea. We were trained in sports physiology! We never thought of ourselves as artists. But Pam changed that. We began to look at the world in a whole new way. We felt born again. We knew our lives had changed forever. In August of 2003, we found a small piece of wood with a hole in it. The wood was just lying there on the ground. It was a piece of nothing that was doing nothing; serving nobody. It had no purpose. But thanks to Pam, our eyes and hearts now interpreted the world in a new way—through the eyes of artists. We picked it up. Held it to the light. Moved it around and investigated it. We realized this inanimate object that served no purpose could and should serve a purpose—and it was up to us to give it a purpose. So, that’s what we decided to do. We threw a “coming out party” for the piece of wood. We painted it, found just the right string for it and, voila, we had created our first ever Inga and Evija necklace! And it was beautiful! Now we began to believe we could make a living creating art. We decided to become entrepreneurs, or rather artrepreneurs! And why the hell not— it was the American dream we were searching for. We were inspired by what we did with a mere piece of wood. And we soon found others who also loved our piece-of-wood turned into a lovely necklace. Or maybe they found us? Either way, we became determined to inspire others by transforming found materials into beautiful, FUNCTIONAL ART BY INGA AND EVIJA! Hell yeah! We were stoked! We managed to find and save up the money and bought the world’s smallest sewing machine. Why? 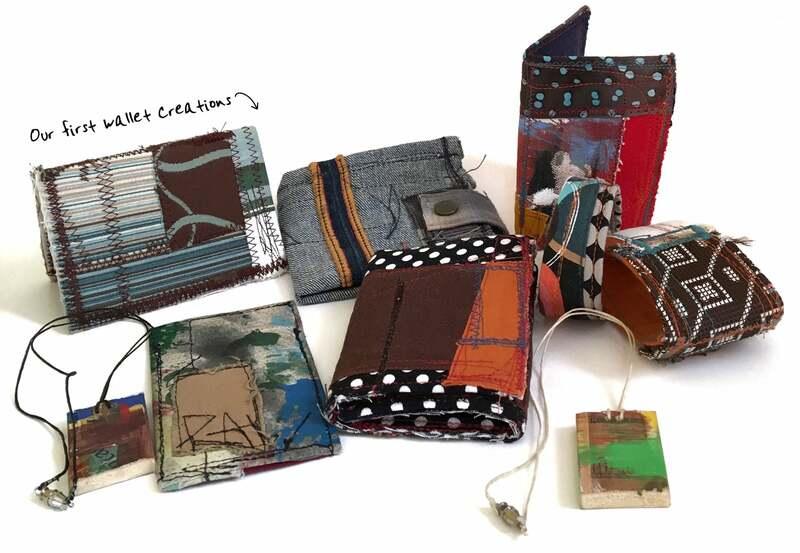 Because we were consumed with the idea of making wallets out of … (ready for this? )—clothes from our closet! Plus, who were we kidding—we couldn’t afford to buy new fabrics and, after all, we thought it would be awesome to breathe new life into old clothes. We also developed a passion for recycling, reusing and repurposing. Then it hit us: Why not marry our love of art, love of inspiring others and our love for our fragile planet by creating functional art all made from found fabrics? Ta-da! We now had the foundation of our business! Today we are living our passion. We’ve discovered our American dream. 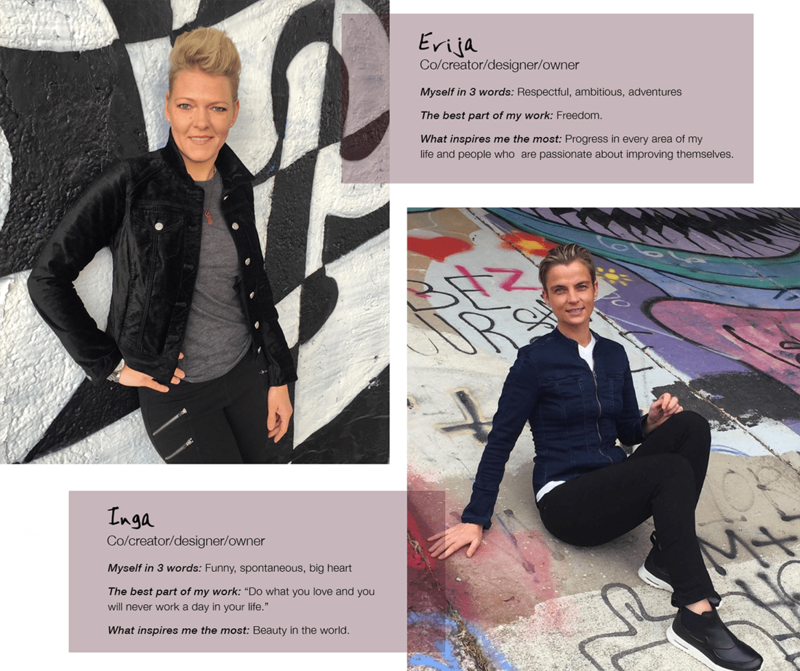 Our mission is to inspire people to be unique, to follow their passion and to experience the wonders of life … And we hope they will do this while carrying a garment made by us, Inga and Evija!